Riky� is a Mercurian Impact Crater named after Sen no Riky� (who was born in Sakai, Osaka Prefecture, Japan, in the AD 1522, and died in Kyoto on April, 21, in the AD 1591), the Master who was central in the development of the Japanese Tea Ceremony. Riky� Crater sits in Mercury's Northern Plains and is expected to host Water Ice - deep down on its Floor (just like it is thought to happen on certain Polar-located Lunar Craters) - because of its persistently shadowed interior and radar-bright signature. Today's APOD features a North/Western segment of the Crater Wall, where an approx. 4,1 Km-wide (such as about 2,54 miles-wide) Simple Impact Crater has resulted from an impact that occurred, eons ago, on Riky�'s Rim. 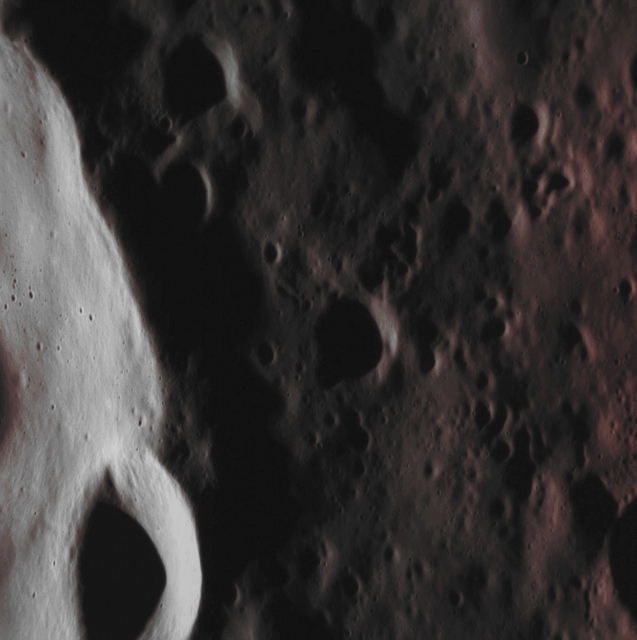 This High-Resolution Image, taken by the NASA - MESSENGER Spacecraft on August, 4, 2012, also provides us with a fantastic view of the tiny Impact Craters that heavily mark the Riky�'s Outer Wall. This picture (which is an Original NASA - MESSENGER Spacecraft's b/w and NON Map-Projected image published on the NASA - Planetary Photojournal with the ID n. PIA 18675) has been additionally processed, contrast enhanced, Gamma corrected, magnified to aid the visibility of the details and then colorized in Absolute Natural Colors (such as the colors that a human eye would actually perceive if someone were onboard the NASA - MESSENGER Spacecraft and then looked outside, towards the Surface of Mercury), by using an original technique created - and, in time, dramatically improved - by the Lunar Explorer Italia Team. Different colors, as well as different shades of the same color, mean, among other things, the existence of different Elements (Minerals) present on the Surface of Mercury, each having a different Albedo (---> Reflectivity) and Chemical Composition.